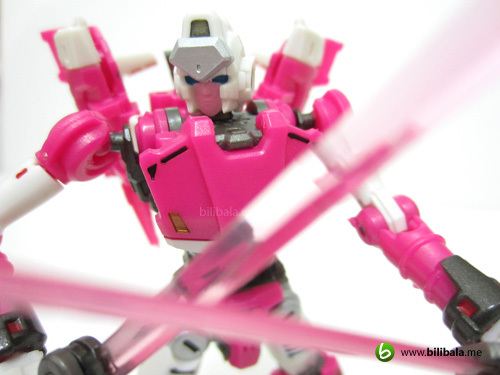 Recently 3rd party Transformers toys have been quite happening and there’s a lot worth mentioning stuff which definitely will burn a hole in your pocket. 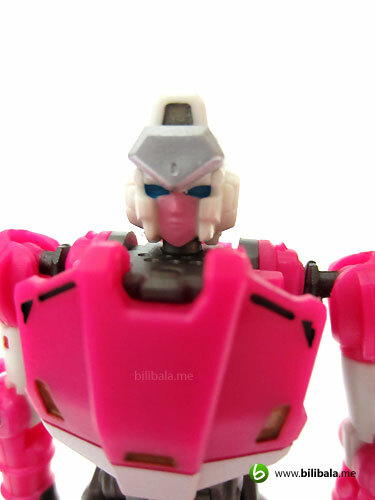 Well, RC is one of the worth mentioning and of course, due to copyright issue, they can’t use the name of Arcee but she definitely bear the same resemblance of what Arcee should be, minus the Autobot insignia that is. 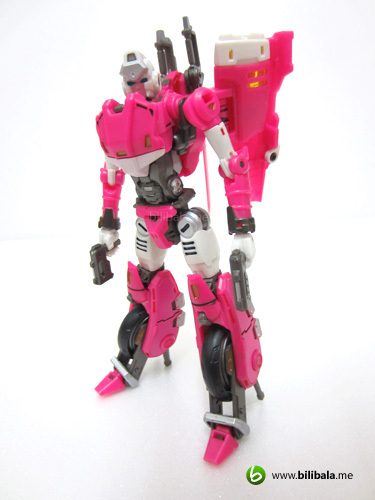 Of course, being an Arcee fan of all time, I have tried to collect as much Arcee mold as possible and this one is possibly the best Arcee mold that have come across, in terms of play-ability/ gimmick/pose-ability. 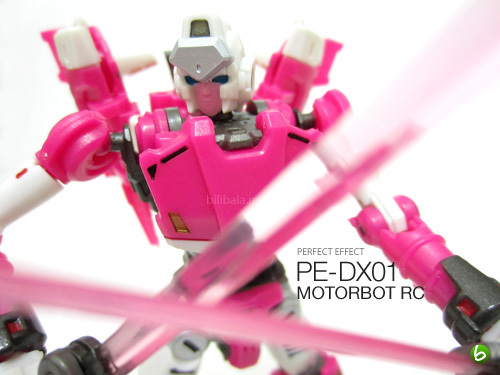 Despite the price being of the stiff side, this 3rd party RC definitely has what she can offer to justify the higher side of the price. Read on! Upon first glance of the packaging of this RC, the design is quite a reminiscent of G1 packaging with almost similar treatment of red/black and white grid around. In addition to the touch of some Japanese writings as well. 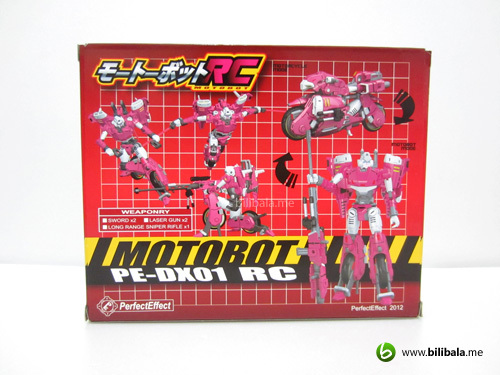 The back of the packaging shows some gimmicks of what this RC is going to offer. Despite being a small packaging, the contents inside are definitely a lot more out of expectation. You can notice the numerous small parts for the toys, a comic book and the instruction manual. The comic is nicely done and featuring fully colored with a touch of anime style. 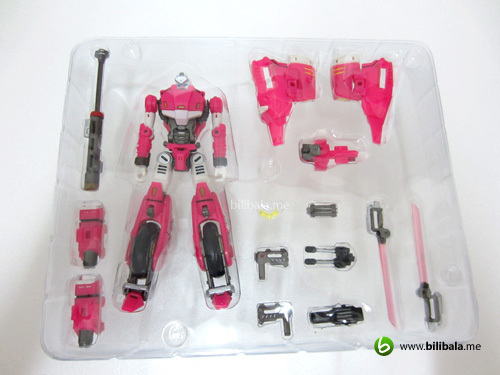 Much like those IDW styled or even those come with Fansproject. 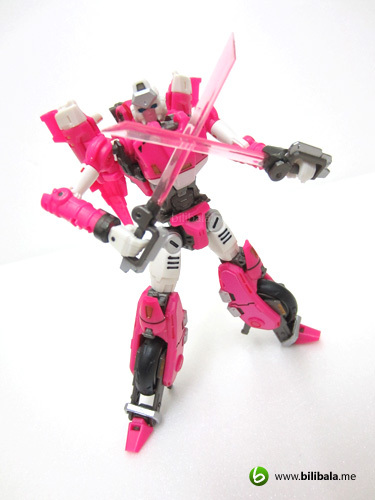 From the comic, it does give cues of some upcoming figures which are going to be released by Perfect Effect as well. A closer view of the “parts” and the main body of RC. To be frank, there’s really a lot of small parts which you definitely would like to safe keep them in the box at all time. Due to the smaller size, i found that these parts are quite delicate to be played with and not to mention that i had an bad experience of it’s QC when i first laid my hand on it. Fortunately, I managed to get an exchange from the local shop on one of those QC parts and believe me, it is a must that you open up your RC and check thru them to avoid any of the parts having problem. 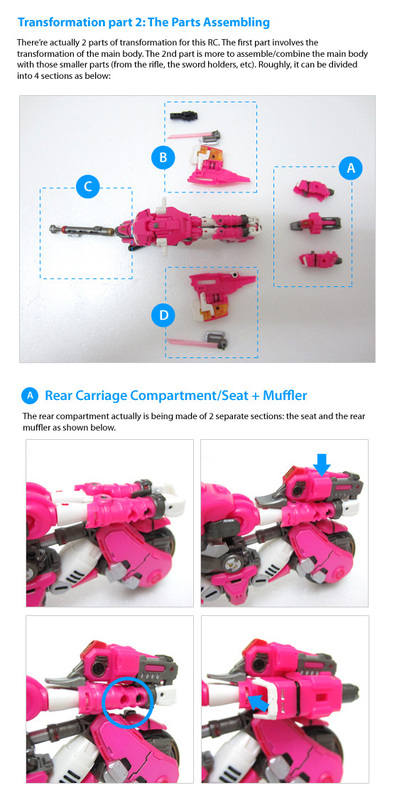 If either of the parts is having problem, you WON’T be able to have the complete experience of her as most of the parts are interconnected either during alt mode or robot mode. After removing from the plastic cover, things are small, a lot in quantity, delicate but detailed. It’s a love and hate situation but it’s definitely not for those careless collectors who are prone to loosing their parts or being too rough to the figure. Handle with care is another term to explain. 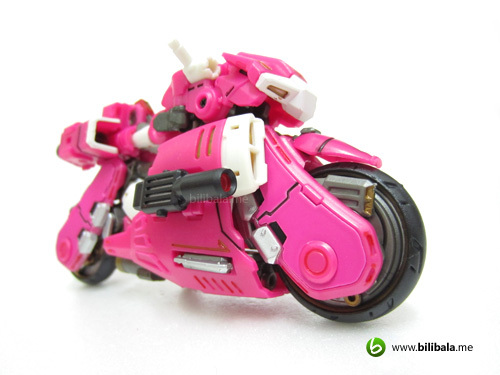 Somehow of recent mold of Arcee, it tends to be pink and motorbike. Well, for this RC, you will be expecting the same. 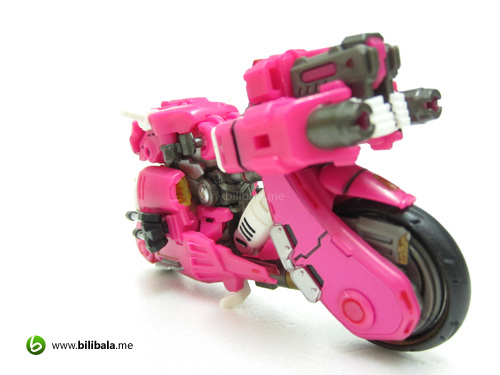 It’s still a bike but hey, it’s a way cool cybertronian motorbike with the “G1-inspired” pink color. Though everyone is expecting the true G1 form of her being a sport car, but somehow, designers are bored with designing cars perhaps. 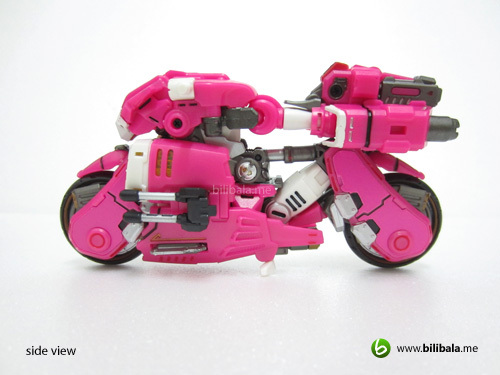 It’s more challenging to design a motorbike who can transform. Especially with one that holds hidden parts together. Yeah. Well, you won’t be paying a hefty price for a normal deluxe class toy. This RC comes packed with details, coloring and every bit of treatment to the detail is of the top notch side. From the smallest details of a head lights you will be expecting to see black lining and orange color treatment. However, be expected to see some of the black linings not being painted straight and minor paint chips can be observed as well. Not too much to overwhelm the overall greatness of her. A side profile of the bike shows even more eye pleasing details with the adequate usage of black linings and minimal color to bring out the greatness of the details. 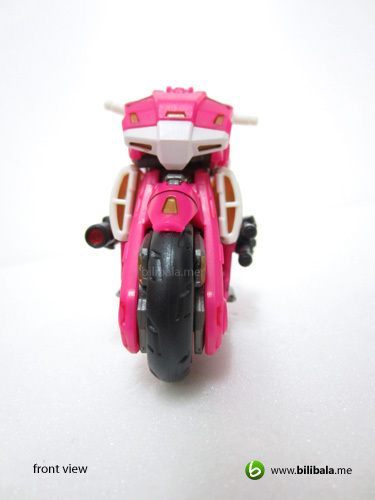 Clearly, you can expect to see certain detail parts as well such as the the bike’s engine (painted in metalic silver). A part which i don’t really fancy is how the rear looks like. 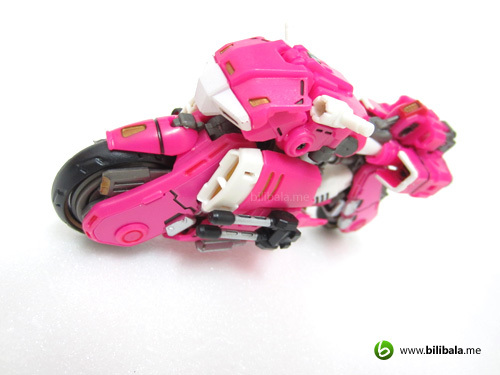 You can clearly see both of the hands constituting the “backside” of the bike. There isn’t any tail light to be observed and the bike exhaust is being replaced by a double cannon like parts. Well, one thing for sure, don’t expect rubbery tyres for her. They come in cold, hard and solid plastic. The design of the RC is very much based on the Alex Milne’s version for the IDW Transformers Spotlight. It’s a nice design nonetheless. 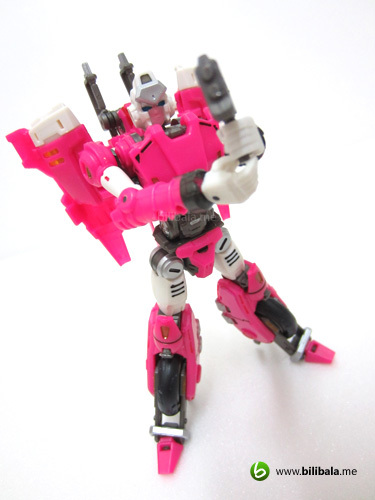 Speaking of which, although she is in a deluxe class, she weights much like a voyager/leader class. Thanks to the die-cast parts located at the legs to enhance stability. Another justification of why the hefty price I guess. 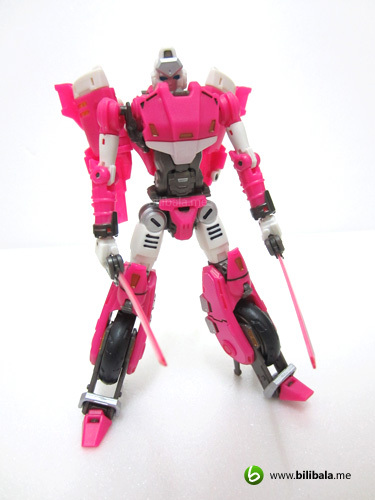 Well, of course, the details for the robot mode is overwhelming attractive. 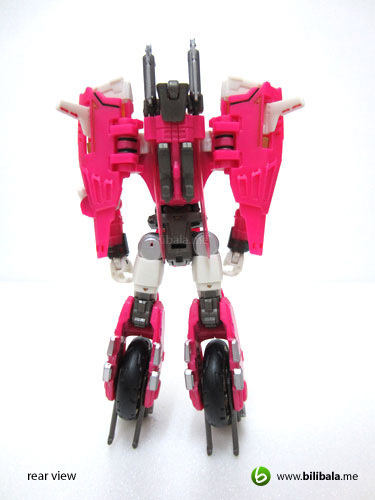 She exhibits overall eye pleasingly with the combination of black linings, minor paint jobs and the sharp pink. 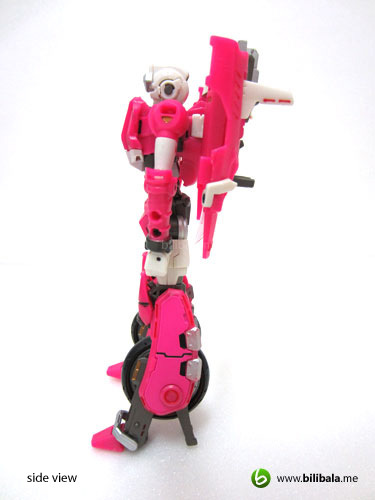 This version of RC actually has a winged like backpack attached to her back. It is pretty much detachable to have a more cleaner and lighter RC. In all, the backpack doesn’t really drag the figure or create instability for her. She stands firmly on ground or even performing certain acrobatic pose. Thanks to the die-casts again. A closed up view on the head sculpture of RC. 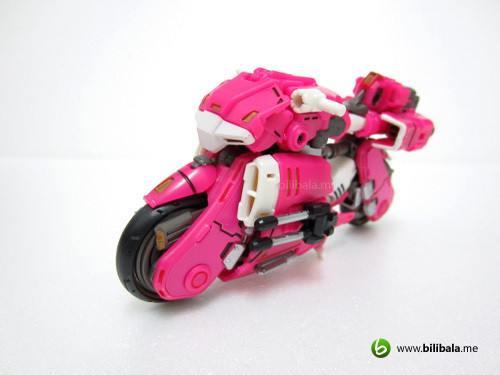 There are no light piping mechanism and the sculpture is relatively simple but does bring out the character. Somehow the main triangular header piece is a bit too overwhelming. It kinda reminds me of headpiece wore by Naruto. lol. 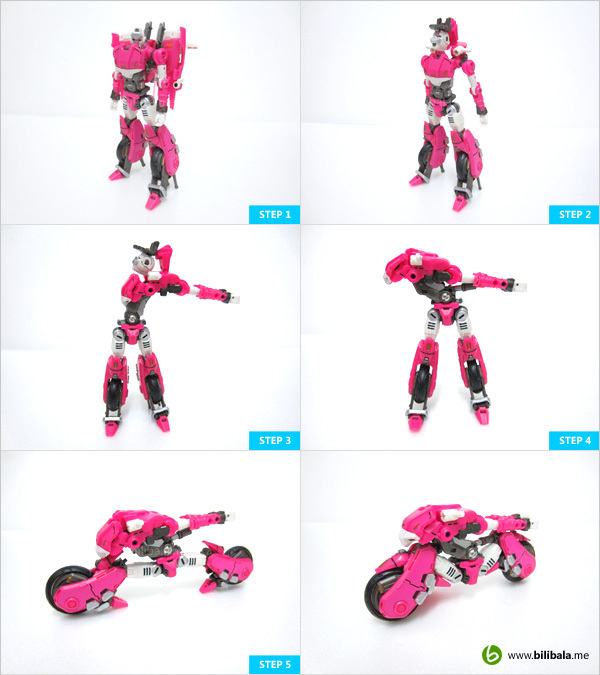 RC is highly articulated and the pose-ability is amazing. You can really do all sort of fancy pose with less to worry of the instability. BUT, certain joints are delicately constructed and a tougher manipulation will cause the joints to be broken, especially with those really thin and slim limbs. I have experience of breaking one of the hand joint (as it is designed to ONLY flip down and not flipping up) and the plastic just broke like “bean curd” though not so excessive force has been applied. 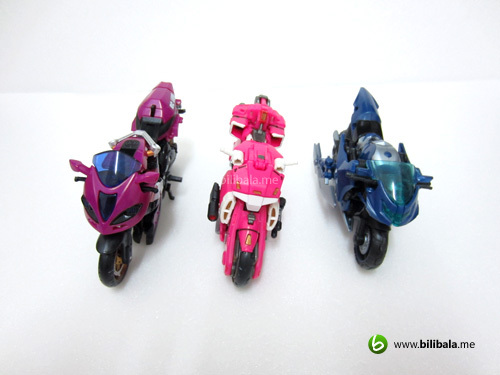 So, dear collectors, play with caution and really treat her like a girl. Transformation can be real hectic especially certain points need EXCESSIVE force to lock the parts. This is where STEP5 is, you have to lock the legs to form an angular position of the wheel in order to proceed. 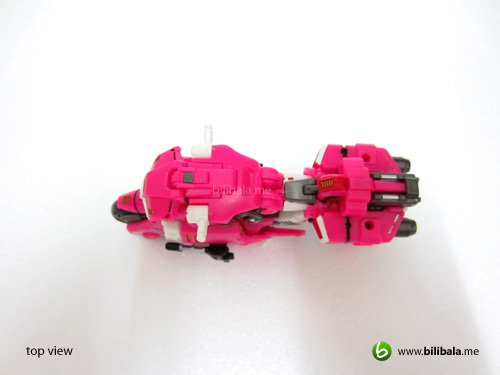 First time transforming the said step is simply annoying as you are having the dilemma of whether you will accidentally break the fragile parts or successful locking them. After that, the rests are a breeze though intermediate complication. 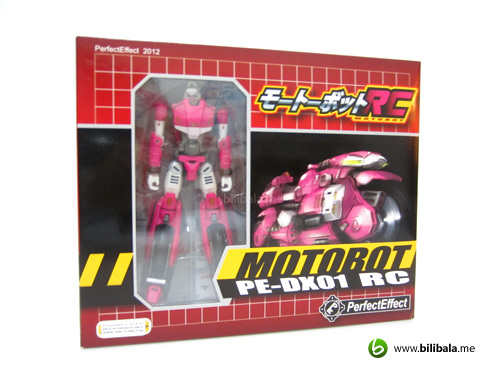 There’s a major different in the transformation of this RC compared to others. It can roughly divided into 2 parts. 1st part being the transformation of the main body and the 2nd part is the attachment of the various smaller parts to it to complete the transformation. You might be wondering how this RC stacks up with other deluxe classes. Well, in order for a comparison, i have used the various version of Arcees. 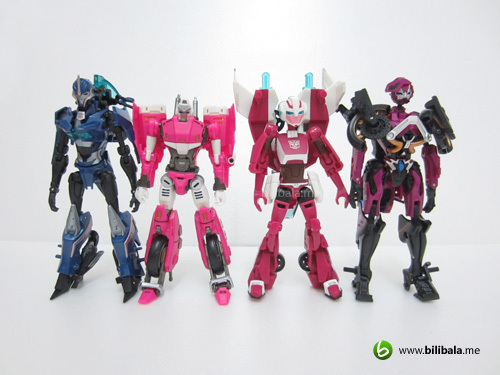 The size is actually in between the TFTM Arcee and the TF Prime’s. 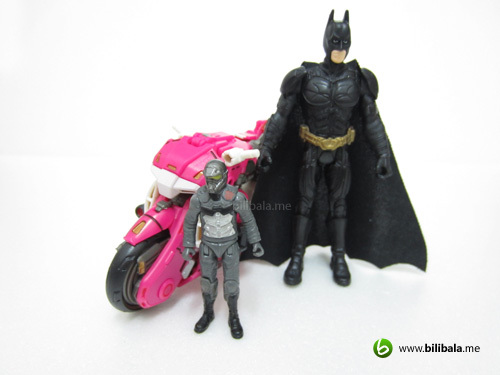 Comparison between a 3.75 inch Batman and a Human alliance basic figure just in case that you wanna give both of them a ride. Definitely the 3.75 wins the proportion. 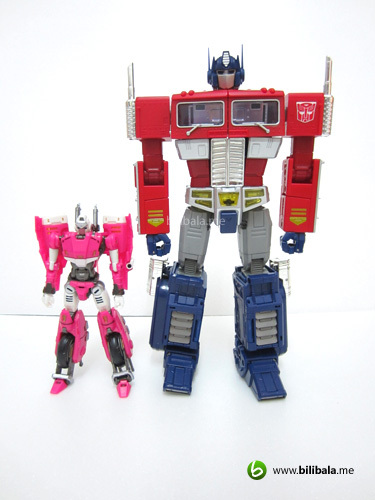 The RC is being dwarfed by the MP10 Optimus Prime. Right on proportion? you tell me. 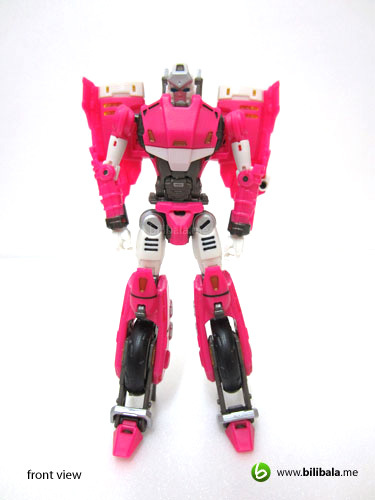 She is definitely smaller as compared in robot mode among her twin-selves. But one thing for sure, she is much more heavier and slimmer among all. Be proud of it. Feast your eyes with what RC is going to offer. 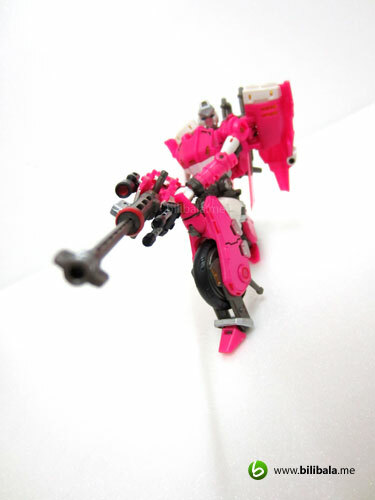 A John Woo style rendition by RC! 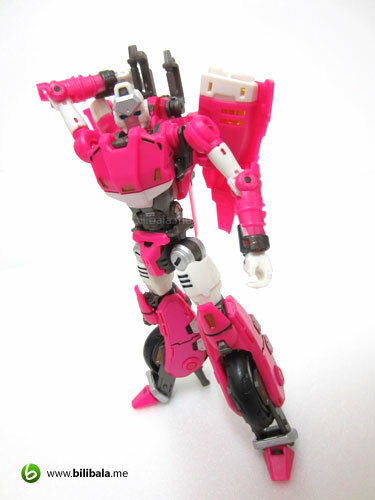 There isn’t a lot of Arcee mold in the Transformers toyline, this RC does really standout from the officials one with it’s play-ability pose-ability and details. Well, putting aside the cost factor that is. If budget is not a matter to you, it’s a worth piece of collection. 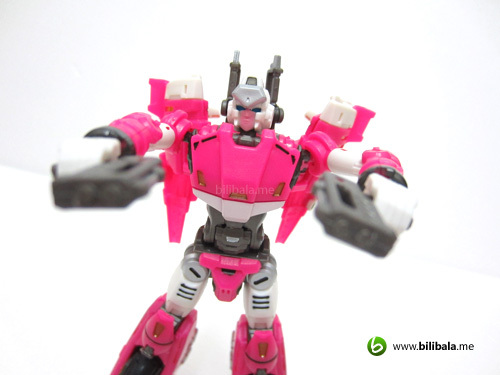 In all, you don’t often have a Transformers with so much parts to play with and to transform with! 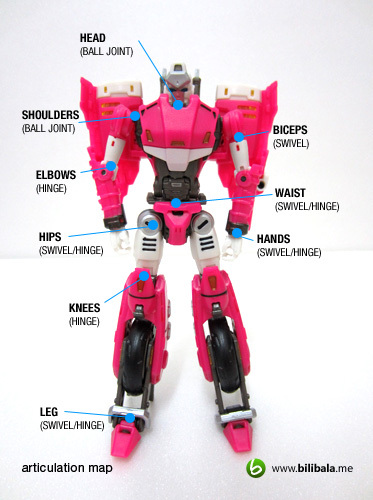 What I like – Parts and parts, is like constructing your own robot; amazing details and articulation; great stability with die-cast enforced. 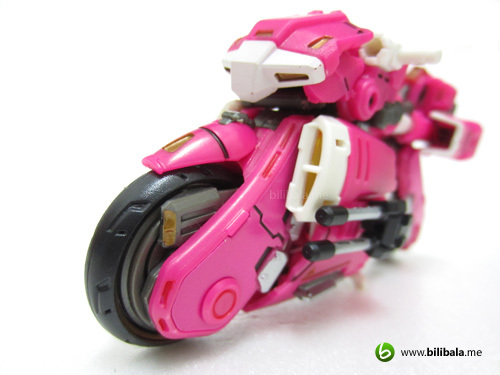 What I dislike?– Delicate and fragile parts reduce the joy of playing it; 1st transformation is hectic as the strangely designed locking mechanism of the legs. great figure and review. 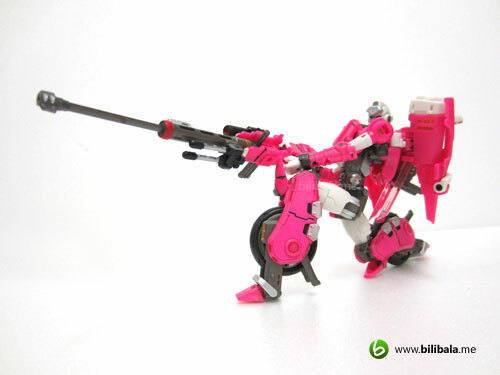 surprised that it is smaller than FE arcee. Crap, wrong photo. 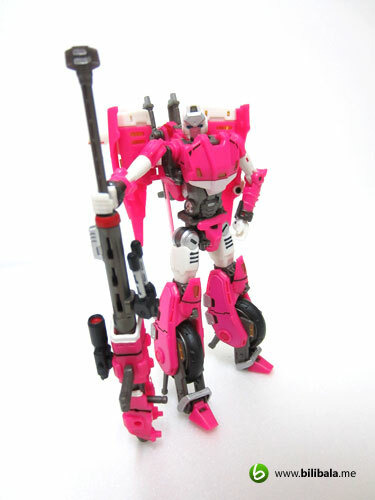 This is the one: http://www.e-life.youthinks.com/picture/cms/bartley2.jpg But in all, Perfect Effect's designs are lookin' good! 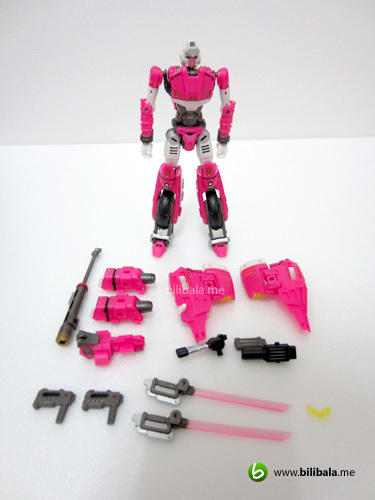 it is really a great 3rd party figure.. all accessories are so details, but so small, wondering are they fragiles?